In the next two years, Bhutan will launch its first satellite fulfilling one of the visions of His Majesty The King. Three in-service engineers will be leaving for Japan by the end of this month to study space engineering. The country will be launching cubesat, a miniaturised satellite. The three will be at Kyushu Institute of Technology in Japan next month. They have been working as engineers with the health and information and communications ministry. The trio will complete their masters programme in 2018. 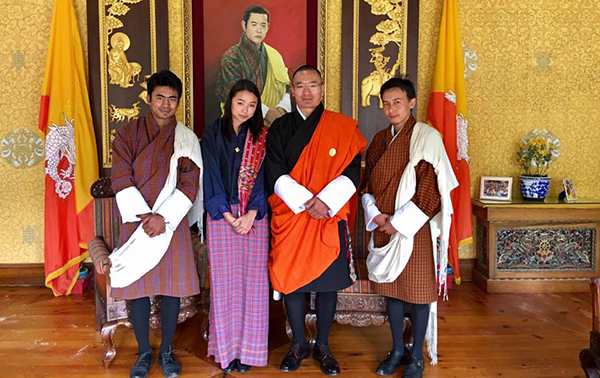 They recently met with the Prime Minister Tshering Tobgay. The Prime Minister said the cubesat will be used to take photographs of the country, to study the situation of the glacier and lakes, and to do some basic communications. “For the first time, in addition to using space technology, Bhutan will be developing our own capacity to enter the frontier of space,” said Lyonchhen. He said the government will be developing the country’s first space agency within the ministry of information and communications where the trio will work after completing their course. The three candidates will have to design, build, launch and operate the Cubesat as a part of their course. Bhutan has two orbital slots which are still un-used.